After yesterday's ec 10 lecture, students were offered a hard copy of the student-run Harvard College Economics Review, which my blog readers can get online. In it, you can find an interview with Larry Summers, as well as profiles of Brad DeLong, Daron Acemoglu, Robert Aumann, and Thomas Schelling. I am a second-year assistant professor at the United States Naval Academy (I finished my Phd at UC Davis, summer '05), and regular reader of your blog and thought I might offer a slightly different perspective on your post: "Advice for Junior Faculty"--since many of your blog readers may be new faculty such as myself: at a school that places a lot of emphasis on teaching, but we still still need to publish in peer-reviewed journals to get promoted. I decided to set up a blog this semester for my senior level class on monetary policy in order to foster class participation (and get the students to read the news, hopefully). I post a couple times a week (in the style of your blog and marginalrevolution.com) and then ask/require the students to respond to the posts. Their comments go towards participation points in the overall grade. *A class blog is a way of connecting with students and providing a different way for them to participate in the course. This hopefully makes the course a more enjoyable experience for both teacher and student. *A blog is a way to provide "innovative" technology into the course content; being online is a regular part of today's college student's lifestyle--this exploits that. Frankly, at a teaching school such as USNA (or comparable places, say, liberal arts colleges with around 5000 students or less), using a "fresh" teaching approach will be valued more, ceteris paribus, during tenure review than for those at a research school. i) You post only a couple of times a week and keep the posts short (I also generally go with short articles on cnn.com). ii) Your classes are small. I have approximately a total of 50 students across three classes this semester. Lastly let me note blogs such as yours and marginalrevolution.com provide positive externalities for those of us at teaching schools. I can check them and then alert my students to the "day's headlines." If you're interested, here is the link. In today's LA Times, Larry Summers offers some advice to China. Approximately only the top 20% of published journal articles really make any difference at all. Most of the rest are read by scarcely anyone but the editors and referees that decide the papers' fate, and do little more than earn their authors tenure and merit pay. On the other hand, writing one of these papers in the lower 80% can be a useful exercise. It keeps you connected to the literature, the questions top researchers are asking, the methods they're using, the results they're finding. It helps keep you as part of the discussion. Still, I feel that the social benefit of published journal articles outside the top 20% is way smaller than the private benefit, and too small to justify their overwhelming importance in promotion and tenure decisions. I have colleagues (not necessarily in my department or college, but maybe) who publish a high quantity of articles in "C" journals, get $2500 merit pay raises every year, and are living large. But if you read one of their papers, you have to wonder what the contribution is, why anyone would bother reading it. The ability to do research in this lower 80% serves as a barrier to entry and reduces competition among teachers and schools. I wonder if this might be why schools stack the incentives toward mediocre, unimportant research and against more socially meaningful things like exceptional teaching that truly makes a difference. If someone knows of a different reason, please say so. I would much rather hold a less cynical view about this. I am inclined to agree with Ron that universities should give more weight to teaching relative to research. Yet I am not fully convinced about my own judgments here because I do not understand what market failure leads universities to overweight research. Note that Harvard may now be moving in the direction of elevating the role of teaching. Only time will tell whether this change is real or just "cheap talk" aimed at satisfying alums and other donors. Economist Thomas Sowell takes on Barack Obama. Economist James Galbraith (son of John Kenneth) takes on the Hamiltonian Democrats. I've read your "Advice for..." blog posts with interest. They're truly helpful. But now I've finished the job market and I have a tenure-track position at a research university. Can you post an "Advice for Junior Faculty" next? Your focus should be on getting papers published in refereed journals. Everything else is secondary. Do not be a perfectionist. It is tempting to keep revising your dissertation chapters until you are completely satisfied with them before sending them off to a journal. The problem is that you may never be completely satisfied. Meanwhile, the editorial review process is unconscionably long, and your tenure review is approaching. So don't delay. If you just got a job as an assistant professor at Bigshot University, aim to send your dissertation research to journals before you arrive at Bigshot to start teaching. It pays to be a good teacher and a good citizen in your department: Your senior colleagues will be more likely to want to keep you around. But don't deceive yourself into thinking that great teaching or citizenship will make up for a paucity of published research. For women and minorities: Be especially wary of invitations to sit on university committees. I have noticed that deans and other university administrators like to promote diversity on their committees. They never seem to figure out that, as a result of this "tax" on women and minorities, we white males are left alone with more time to pursue our research. Attend conferences and give seminars at schools to publicize your work and yourself. The people in the audience may one day be in a position to hire you or write letters of evaluation about you. Tenure review committees give a lot of attention to where papers are published (perhaps too much, in light of this work by Andrew Oswald). Give each of your papers a shot or two at the top journals, such as the AER, JPE, or QJE. Even if you are not confident in the paper, it is worth a try for two reasons. First, as author, you are not in the best position to judge its quality; some people are too fond of their own work, and some are too hard on it. Let the editors decide. Second, the editorial process is highly imperfect. (Again, see Oswald.) The bad news is that some of your best articles may end up getting rejected from the top journals. The good news that you may get lucky, and some of your so-so articles may end up published in top journals simply because they hit the editor's desk when he is in a good mood. Do not get discouraged by rejection. It is part of the process. Learn what you can from the editors and referees and then take your paper to another journal. Be on the lookout for good coauthors among your colleagues and students. See My Rules of Thumb for more discussion of this topic. Avoid activities that will distract you from research. Whatever you do, do not start a blog. That will only establish your lack of seriousness as a scholar. Remember that you got into academics in part for the intellectual freedom it allows. So pursue your passions. Do not be too strategic. Be wary of advice from old fogies like me. Isn't modern information technology wonderful? If it weren't for Google, I wouldn't know what Puspini's brother is reading. Sinegal says he's also built a loyal work force. In fact, Costco has the lowest employee turnover rate in retailing. Its turnover is five times lower than its chief rival, Wal-Mart. And Costco pays higher than average wages — $17 an hour — 40 percent more than Sam's Club, the warehouse chain owned by Wal-Mart. And it offers better-than-average benefits, including health care coverage to more than 90 percent of its work force. CBO has just released its biannual report on Budget Options. The document is wonderfully useful to estimate the budget effects of numerous policy alternatives. For example, if I am reading it correctly, we could increase the gasoline tax by $1 (see revenue option 48) and reduce all ordinary income tax rates, AMT rates, and dividend and capital gains rates by 2 percentage points (see revenue option 1) to produce an approximately revenue-neutral tax reform. If that policy were already in place, would many people advocate raising income tax rates in order to lower the gas tax? I don't think so. Opposition to this proposed reform seems to be an example of status quo bias. In a few years, we will enter a period of chronic crisis, scraping by each year with a painful series of budget gimmicks, fee increases, and disguised tax hikes—just enough to get by for the year before the dreary cycle begins again. After a few years, the public impression would be of a government that is constantly raising taxes, constantly cutting services, yet never solving either the fiscal crisis or other problems. Does drug treatment for depression with selective serotonin reuptake inhibitors (SSRIs) increase or decrease the risk of completed suicide? The question is important in part because of recent government warnings that question the safety of SSRIs, one of the most widely prescribed medications in the world. While there are plausible clinical and behavioral arguments that SSRIs could have either positive or negative effects on suicide, randomized clinical trials have not been very informative because of small samples and other problems. In this paper we use data from 26 countries for up to 25 years to estimate the effect of SSRI sales on suicide mortality using just the variation in SSRI sales that can be explained by cross-country variation in the growth of drug sales more generally. We find that an increase in SSRI sales of 1 pill per capita (about a 12 percent increase over 2000 sales levels) is associated with a decline in suicide mortality of around 5 percent. These estimates imply a cost per statistical life far below most other government interventions to improve health outcomes. 1. Does Reich pay his nanny, cleaning person, and gardener more than half the median wage of members of his family? 2. If not, should I refuse to buy his books? Update: After reading the surprisingly numerous comments on this post, I appreciate that my motivation for asking these questions is not obvious. Let me clarify. Mr. Reich is in effect saying, "A nation should not trade with other nations that have too much inequality." So, I wondered about the parallel conclusion: "A household should not trade with other households that have too much inequality." Is there any reason to think that a nation is the right unit of analysis when thinking about trade and inequality? If inequality within a nation is objectionable, why not inequality within a household? One lesson of Ricardian trade theory is that interpersonal trade and international trade are similar phenomena: Both are motivated by comparative advantage and the desire to realize the gains from trade. I was merely extending the analogy to the topic that Mr. Reich raised. In today's NY Times, David Leonhardt reports on the debate over climate change at Yale, where economists Bill Nordhaus and Nicholas Stern recently engaged in some intellectual combat. David ends the article with his membership application to the Pigou Club. In a new study, economist Robert Shapiro, former Undersecretary of Commerce for Economic Affairs in the Clinton administration, finds that carbon taxes are a better response to the risks of global warming than emissions caps and tradable permits. Here is the executive summary and the full report. 1) People are often stupid. 2) Bureaucrats are the same stupid people, with bad incentives. Here you can buy 10 economics lectures for $1.60 per lecture. By contrast, Harvard tuition is about $30K (not counting room and board). Assuming 4 courses each of the two 12-week semesters and 3 class hours a week in each course, one finds that each hour class at Harvard costs about $100--roughly the same price as a good ticket to a Broadway show. I suppose there is something special about live performances. I am a student of Economics at the University of Oslo. And as part of my reading list I come across a paper you wrote in 1995--The Growth of Nations. I must say it is one of the best articles I have read on the issue. But up on completing the article I am left with two important questions. First, though you have emphasized the limitations of cross country regressions in answering most of the important questions growth theories are supposed to address, there appears to be an influx of such empirical works until recently. So my question here is: How much do you think such works have solved the problems you mentioned empirical works are subjected to. Second, on page 309 of this same paper you said that ''the implications of recent work on economic growth for policy makers are far from clear.'' My question with this regard is: Do you think later studies (studies after 1995) have come up with a somewhat clearer policy implications? If not I wonder what policy advisers are being paid for. I have long been skeptical about how much one can learn from cross-country growth regressions. In the early 1990s, I wrote one paper in that literature, coauthored with David Romer and David Weil, and to my surprise, it turned out to be my most cited paper by a very large margin. In a subsequent paper, The Growth of Nations, I tried to spell out the reasons for my skepticism. I emphasized three problems, which I called the simultaneity problem (it is hard to disentangle cause and effect), the multicollinearity problem (most of the potential determinants of growth are correlated with each other and imperfectly measured, making it hard to figure out which is the true determinant), and the degrees-of-freedom problem (there are more plausible hypotheses than data points). To some extent, the subsequent literature addresses some of my concerns. For example, there is more attention now to trying to find exogenous differences across countries, but the task is inherently difficult, so one should not expect to find definitive answers about the causes of growth from this literature. That does raise the question: If such empirical work is so far from definitive, what are economic policy advisers paid for? (Actually, "paid for" is the wrong phrase--being a policy adviser is not lucrative and sometimes, as in the case of my role in the Romney campaign, not compensated at all.) Economists come up with policy advice not because a single regression yields a particular coefficient but because they have weighed a large variety of evidence from different sources, together with the insights from theory, and reached some educated judgments about the effects of alternative policies. No doubt, political bias can at times affect those judgments as well. In light of this process, it is no surprise that different economists reach different judgments about policy. They differ about which evidence they find most compelling and about which theoretical assumptions are most plausible, and they bring different biases to the task. On some issues--international trade, rent control--economists speak with a high degree of consensus. On other issues--income redistribution, health policy--economists are more divided. The fact that definitive conclusions are difficult in economics makes the field both frustrating and challenging. Cross-country growth regressions are part of the process by which economists figure out how the world works, but they constitute only one patch of a large quilt of theory and empirics. Does anyone remember the big economic threat of 2004? Have lunch with two Nobel laureates. My overall conclusion is that, so far, the Part D program has succeeded in getting affordable prescription drugs to the senior population. Its privatized structure has not been a significant impediment to delivery of these services. Competition among insurers seems to have been effective in keeping a lid on costs, and assuring reasonable quality control. We do not have an experiment in which we can determine whether a single-product system could have done as well, or better, along these dimensions, but I think it is reasonable to say that the Part D market has performed as well as its partisans hoped, and far better than its detractors expected. To increase energy security and reduce global warming, we would impose a carbon fee or tax on energy producers of $15 per metric ton of carbon emissions, phased in over a three-year interval, which could raise about $35 billion a year. This fee could be collected by auctioning off permits to private companies under a cap-and-trade system, or levied as a direct tax on the businesses (which in turn, of course, would pass costs along to consumers). Read their article for other proposals to tame the deficit. Of all the thankless jobs that economists set for themselves when it comes to educating people about economics, the notion that society is better off if some industries are allowed to wither, their workers lose their jobs, and investors lose their capital -- all in the name of the greater glory of globalization -- surely ranks near the top. In today's NY Times, economist Robert Frank makes the case for a government-run health system, along the lines they have in France. Somewhat oddly, however, for support he links to an article coauthored by economist Victor Fuchs which calls for universal coverage through a system of "health care vouchers," which seems to maintain a role for private insurers. Note that the Bush health plan is not all that far from a voucher system. If we eliminate the tax exclusion for employer-provided health insurance and give everyone a refundable tax credit, rather than a deduction, if they have at least basic health insurance, as the Washington Post recently suggested, then we have in effect given each taxpayer a voucher equal to the credit amount that can be used to buy health insurance. That seems to embrace the central element of the Fuchs plan. In today's NY Times, an article on prediction markets for political outcomes starts with a story about Betsey Stevenson and Justin Wolfers, both PhD graduates from the Harvard econ department. (Justin is also a coauthor of mine.) Here is some of Justin's research on prediction markets. Volcker said taxes either on emissions or on petroleum could be effective in reducing global warming, although it would be difficult to reach an international consensus on the desired levels. "It's an area where in my view the United States has been particularly delinquent," he said, adding it would be wiser to impose a tax on oil, for example, than wait for the market to drive up oil prices. A tax would give the government "some leverage that you can use for other things." By "other things" I would include reductions in distortionary taxes. It is always hard to get used to new information technologies. Whoever is in charge of space planning at Harvard does not like the economics department. Economists Joe Stiglitz, Nicholas Stern, and Martin Weitzman have new pieces on global warming. The most interesting (as well as the most technically demanding) is the one by Weitzman. His conclusion: "The Stern Review may well be right for the wrong reasons." My colleague Ken Rogoff opines on the dollar. From the Council of Economic Advisers, here is the new Economic Report of the President. The purchase of a gallon of gasoline imposes these national security and environmental costs on everyone, not just on the buyer and seller. Though State and Federal gasoline and diesel fuel taxes and regulations help account for these other costs, many studies suggest that the total external costs of oil may be higher. Carefully crafted government policy may be a useful way to account for these additional costs. However, this objective should be balanced against additional inefficiencies that government involvement introduces into the market. Once policies are in place that ensure that individuals account for the full costs of the goods and services they consume—e.g., national security and environmental concerns—competitive markets are the most efficient means to determine how goods are produced, as well as which goods are produced in the future. Does this qualify the CEA for membership in the Pigou Club? Nobelist Ned Phelps offers his view of why European economies lag behind the United States. Today's NY Times has a nice piece on congestion pricing, quoting my colleague Ed Glaeser (of ec 1011a fame). From the latest report of the CBO. But is "campus celebrity" a bit like jumbo shrimp? Here is a profile of Jesse Shapiro, a recent graduate of the Harvard econ department. From Chicago economist Luis Rayo, via today's Washington Post. Or you can read his research with Gary Becker. Economically Literate Members of Congress. Is It Time for a New Tax on Energy? The government should encourage development of alternatives to fossil fuels, economists said in a WSJ.com survey. But most say the best way to do that isn't in President Bush's energy proposals: a new tax on fossil fuels. Forty of 47 economists who answered the question said the government should help champion alternative fuels. Economists generally are in favor of free-market solutions, but there are times when you need to intervene," said David Wyss at Standard & Poor's Corp. "We're already in the danger zone" because of the outlook for oil supplies and concerns about climate change, he said. A majority of the economists said a tax on fossil fuels would be the most economically sound way to encourage alternatives. A tax would raise the price of fossil fuels and make alternatives, which today often are more costly to produce, more competitive in the consumer market. "A tax puts pressure on the market, rather than forcing an artificial solution on it," said Mr. Wyss. For some reason, energy is one of those topics that makes politicians sound like Soviet-era central planners. Here is Hillary Clinton on the topic earlier this week. Click here for my views on energy independence. Ec 10 students all know David Johnson, the head sectionleader and teacher extraordinaire. Yesterday, NPR did a piece on his biologist wife, Anne Pringle, and her research on mushrooms. Q. We've all heard about the gap between what people are saving and what they will need. Is the situation all that bad? A. It's not ideal, but there is a solution that can have a powerfully positive impact: deferring retirement. Quitting at age 65 instead of 62 - just three more years - cuts the average savings shortfall in half! So even small steps make a big difference. Q. But is it realistic to urge people to work into old age? A. With proper planning and investment in your skills ("human capital"), it should be possible to construct a string of careers that will keep you going until your seventies and beyond - at least part time. I tell my students that they should study not for their first job but as if they're going to have six or 10 careers. The trigger of this crisis — hyperinflation — reached an annual rate of 1,281 percent this month, and has been near or over 1,000 percent since last April. Hyperinflation has bankrupted the government, left 8 in 10 citizens destitute and decimated the country’s factories and farms. Mr. Mugabe, who blames a Western plot against him for Zimbabwe’s problems, has rejected all calls for economic reform....The central bank’s latest response to these problems, announced this week, was to declare inflation illegal. From March 1 to June 30, anyone who raises prices or wages will be arrested and punished. Only a “firm social contract” to end corruption and restructure the economy will bring an end to the crisis, said the reserve bank governor, Gideon Gono. "The urgency of the need to reduce inflation impels that 2007 be the year for unprecedented fiscal and monetary policy restraint," Gono said in a monetary policy statement. "To this end, the Reserve Bank will reduce broad money supply growth from the current levels of over 1,000 percent to between 415 and 500 percent by December 2007." It all comes back to Principle Number 9. Economists Brad DeLong and Arnold Kling debate the New Deal. the challenge for policy is not to eliminate inequality per se but rather to spread economic opportunity as widely as possible. An unequal society cannot help but be an unjust society. These quotations go to the heart of the policy divide behind right and left. The key question: To what extent is inequality of outcomes a source for concern in and of itself? People will always differ in productivity. Should policymakers act to offset these innate differerences, or should their goal be to give everyone the same shot and not be surprised or concerned when outcomes differ wildly? To a large extent, policymaking often comes back to Rawls vs Nozick. Update: Brad DeLong believes I have quoted him out of context. If so, I apologize. I encourage readers to read the Bernanke and DeLong pieces themselves to judge whether and how much they disagree. Any lasting solutions [to global warming] will have to be extremely simple, and -- because of the cost implicit in reducing the use and emissions of fossil fuels -- will also have to benefit those countries that impose them in other ways. Fortunately, there is such a solution, one that is grippingly unoriginal, requires no special knowledge of economics and is easy for any country to implement. It's called a carbon tax, and it should be applied across the board to every industry that uses fossil fuels, every home or building with a heating system, every motorist, and every public transportation system. Immediately, it would produce a wealth of innovations to save fuel, as well as new incentives to conserve. More to the point, it would produce a big chunk of money that could be used for other things. Anyone for balancing the budget? 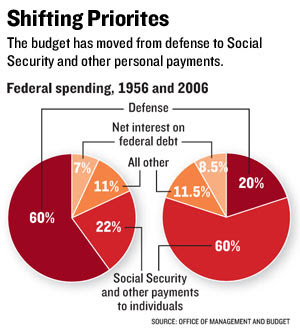 Fixing Social Security for future generations? As a foreign policy side benefit, users of the tax would suddenly find themselves less dependent on Persian Gulf oil or Russian natural gas, too. Most of all, though, the successful use of carbon taxes does not require "American leadership," or a U.N. committee, or a complicated international effort of any kind. It can be done country by country: If the British environment minister or the German chancellor wants to go ahead with it tomorrow, nothing is preventing them. If a future American president wants to rally the nation around a patriotic and noble cause, then he or she has the perfect opportunity. Tim Worstall reflects on morality, inequality, and the Stolper-Samuelson theorem. Ec 10 students are now studying long-run economic growth. This new podcast interview with Nobel laureate Robert Lucas is, therefore, very timely. In his annual budget blueprint to be unveiled today, Mr. Bush intends to showcase a highway "congestion initiative," according to White House documents, with grants for state and local governments to experiment with anti-jam strategies. In a surprise that could foreshadow how Mr. Bush might reach out to Democrats -- and disappoint conservatives -- for the rest of his term, the centerpiece of the traffic plan involves an initiative that some critics say amounts to a tax, a plan depicted by administration officials as "congestion pricing." The administration will award $130 million in grants starting this spring to help cities and states build electronic toll systems that would charge drivers fees for traveling in and out of big cities during peak traffic times. The money also could go to other congestion strategies such as expanded telecommuting, but administration officials make it clear they think congestion pricing is the most powerful tool they have. I am waiting for more details before inducting the President into the Pigou Club, but proposing a tax--excuse me, a user fee--for driving on congested roads would certainly qualify. ...about this news from Utah. The Utah House of Representatives narrowly passed a School Voucher program in a 38 to 37 vote today, which would provide every child in the state with a school voucher worth between $500 and $3,000. If approved by the Senate the bill will become America's first universal statewide voucher program. "The significance of this bill cannot be overestimated," said Andrew J. Coulson, Director of the Cato Institute's Center for Educational Freedom based in Washington DC. "If passed, it will be an unprecedented step forward for educational freedom in America." Coulson also observed that the maximum value of Utah's school vouchers would be only $3,000, only about half of what Utah spends per pupil in its public schools. "Bill 148 would still leave private schools at a considerable financial disadvantage compared to their state-run counterparts,and that would inhibit competition between the public and private sectors and retard innovation." A reader alerts me to a Pigovian cartoon. Here is another. Readers are encouraged to posts similar links in the comments section. Update: A commenter suggests a great one. In the Senate, five of the six Democrats who picked up Republican-held Senate seats have joined a new populist caucus, insisting on fairer trade rules. Tuesday and Wednesday, business oriented Democrats invited three Clinton veterans, Gene Sperling, Robert Rubin, and Larry Summers, to House Ways and Means Committee hearings to defend the old trade agenda, which has produced chronic trade deficits and hollowed out American industry. These worthies called for a "new consensus" -- more deals to ease off-shoring production, sweetened by a little more public money to help workers displaced by trade. Most Democrats weren't buying it. A third promising strategy for tax reform is to rely more on taxes that correct distortions and improve the functioning of markets. For example, as N. Gregory Mankiw has argued, "A tax on carbon is the best way to deal with global warming." There are legitimate concerns that such a tax, by itself, would be regressive and disproportionately affect low- and moderate-income families. These concerns, however, could and should be addressed by combining a carbon tax with other tax cuts that compensate low- and moderate-income families. Or, alternatively, a carbon tax reform could be combined with tax cuts in such a manner that it was both revenue neutral and distribution neutral, although in this case it would not have the benefit of reducing the long-run deficit and thus would not reduce the need for other revenue increases or benefit cuts. Larry Lindsey is concerned that the new Congress will kowtow to unions. There is a strong correlation between illegal parking [of foreign diplomats in the United States] and existing measures of home country corruption. Even when stationed thousands of miles away, diplomats behave in a manner highly reminiscent of officials in the home country. Source: Raymond Fisman and Edward Miguel. Austan Goolsbee gives us his two cents on the penny. Here are my two cents.